A video of a local cat devouring seafood in a store display at Vladivostok’s airport has become a huge hit among Russians. The owners of the store are now demanding compensation from the airport, after the feline intruder caused $1,100 worth of damage. Russian internet users have been captivated by an incident at Vladivostok International Airport, in Russia’s Far East, in which a ginger cat managed to slip into the refrigerated display unit of a store selling fish and seafood. 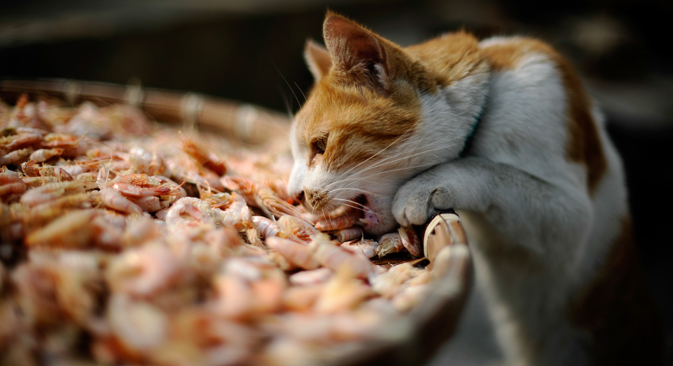 The feline intruder clawed open various packages of seafood, nibbling at calamari and eating dried fish, causing more than 63,000 rubles ($1,100) worth of damage to the store’s goods. The incident, which took place during the night of Dec. 5, came to the notice of Russians all over the country when a video of the cat in the window display appeared on Youtube on Dec. 10. The video has already gained more than 600,000 views. The store’s owner said that the cat appeared to have taken a particular liking to the hot-smoked calamari, though it had also tried the flounder and dried octopus, as well as tearing open several packets of seafood delicacies. According to a salesperson at the store, the sales outlet is operating normally now and the cat "has not reappeared." Interfax reports that the authorities are now examining the airport to determine how the animal gained entry to the facilities and then found its way into the store's display unit. The results of the investigation will indicate who should bear material responsibility for the incident. "The company that owns the store has filed a claim against the airport in relation to the incident," an airport representative told RIA Novosti. "Now the authorities are carrying out an investigation, whose results will be taken into account in order to make the right decision. “It is still not clear how the cat entered the store display. All the sales outlets and pavilions are closed with shutters during the night and the refrigerator displays should also be closed. We believe that it is the store that should guarantee the security of its products." According to the representative, according to flight security requirements and other security measures, it is prohibited to keep animals in the airport. The airport has agreements with specialized agencies that carry out prophylactic sanitary activities to prevent the presence of wandering animals in the terminal. Local media, meanwhile, report that Vladivostok residents are worried about the missing cat. Concerned animal lovers are looking for the feline, which, in their opinion, may be under threat of being put down. It has also been reported that the store's display has already become a site of pilgrimage for passengers who have seen the video. Based on materials from RIA Novosti and Interfax.